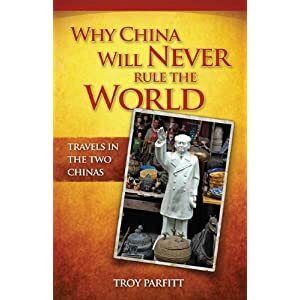 In Why China Will Never Rule the World , Troy Parfitt systematically dismantles the Western assessment that China will eventually replace America as the world’s superpower. He explores the cultural, historical, and economic factors that will preclude the Middle Kingdom from ever becoming a truly great nation, dispelling the myth of Chinese ascension to power that has been propagated by the media, economists, and Westerners in general during recent years. Parfitt reveals a radically different image of China, though his assessments resonate as accurate, supported by interviews, academic research, a remarkable knowledge of Chinese history, and commentary from Chinese social critics. Parfitt demonstrates that far from aiding China, the tenets of traditional Chinese culture are largely debilitating, and that although the Chinese may possess the resources to dominate globally, they lack the necessary awareness, diplomacy, creativity, and intelligence. Partnership with the West outside the economic realm is impossible because of a persistent “culture of dishonesty” and because China blames the West for all its problems. Moreover, China’s authoritarian nature will not win support in the West, nor will it assist in China’s “great rise.” For anyone who has feared the impending doom of China replacing the United States as world superpower, Parfitt’s writing illustrates that this is an ill-informed and poorly researched prediction unlikely to ever come to fruition, as China’s pride will prevent it from truly westernizing, and its many social maladies will likely cause investors and other non-Chinese to avoid doing business there. Although the topic the author addresses is a serious one, readers will often find themselves laughing at his colorful way of depicting the culture, the observations he makes, and the experiences he has along the way. Why China Will Never Rule the World is biting social criticism at its sardonic best, and makes for an informative and entertaining read. It synthesizes a marathon journey, personal narrative, copious research, sidesplitting humor, and extraordinary facts into a cohesive whole that will keep readers riveted from cover to cover. This book was amazingly complete. You will be taken on an amazing ride through the history of the country to the present and through all of this the tie that binds it is the experiences of the author that he brings into the overall story itself. The author does an amazing job at depicting the cultural and political realities that exist in China today, and I mean it when I say that this book is complete. You will be amazed at the detail and the ideas that he shares with readers of this book. What makes this different than other books that you read is the familiarity that the author has with his subject matter and he makes it so easy to understand what he is talking about. I have read other books from people like this author and sometimes these authors talk above the reader, but not in this book. In this book you are taken on a journey towards self-revelation about who and what China is and what is can become and you will ultimately leave this book so much more informed than where you start the book.